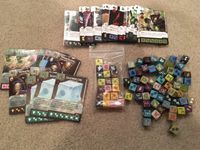 This bundle includes Marvel Dice Masters Avengers vs X-Men and The Uncanny X-Men (contents of both starter sets, and many additional dice and all common and uncommon cards, some rare, 1 super rare). There is at least 3 dice for each of the characters in these two sets. 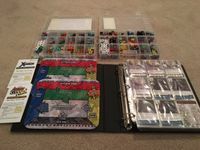 Included is the binder, 2 plano's, 2 playmats (printed on mousepad material), card sleeves.